It has been one heck of an expensive year for this family, all with unforeseen crazy things that have cropped up. Therefore, instead of despairing, I am trying to be thankful that we have been careful with finances and have some savings to cover unexpected expenses. So, in keeping with my frugal mindset more than ever, here are the latest money saving things to happen here…. *I’ve been able to hang out laundry most days. 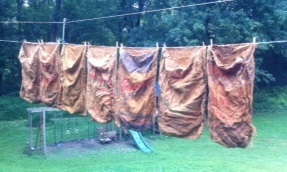 *I found these cool vintage burlap feed sacks at a yard sale for pretty cheap. I would love to try using them in some projects and plan to start with re-covering a stool top with the design portion of one of them. *Haven’t had to do any big grocery runs in a couple of weeks. *We have picked beets, sweet corn, onions, cucumbers, squash, blueberries, and green beans out of our garden. I blanched and froze many, many bags of the beans this past weekend. I also froze some blueberries. *My boys foraged around for some wineberries last week. We ate some and the rest I made into jelly. I had also made some black raspberry jelly a couple weeks back, plus some black raspberry/grape blend jelly. Yum. 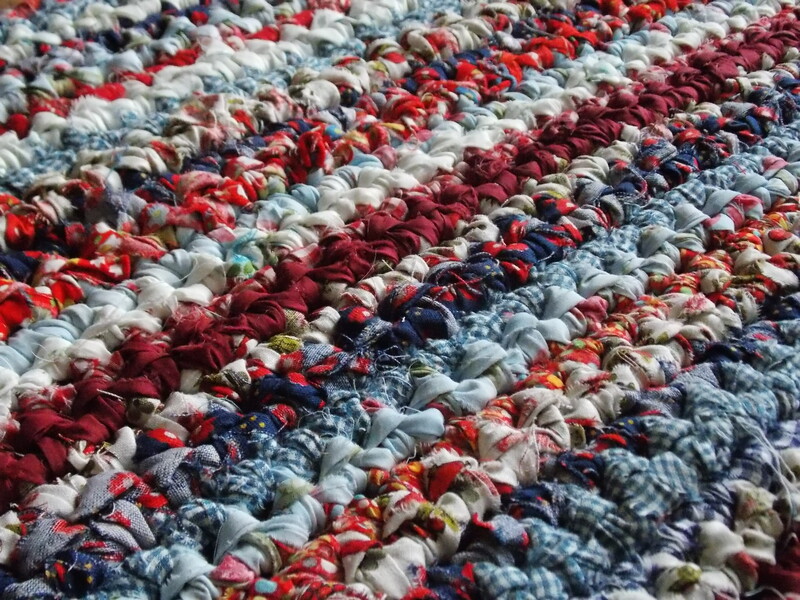 *Sold this rag rug that I had made on Ebay. *Before his accident, my husband brought me a really nice Pampered Chef glass baking dish with a snap-on lid. It had been sitting around his work lunch area for awhile with no one to claim it, so it was free to a good home! *Used zucchini from the garden to make Chocolate Zucchini bread. It was the bomb. *Speaking of my oldest son, he is headed to a camp in Virginia next week that is offering a “Mountain Man” outpost. He doesn’t need to pack that much, but needed a couple of specific items to wear. I scored two pairs of Carhartt beige work pants for an amazing $9.99 each off of a clearance rack. That’s like an absolute steal for Carhartt products (local people, FYI, it was at Good’s store). Then my husband took him to Outback Trading to find a certain style of hat for this Mountain man thing. I am proud to say that they found a really cool one that is perfect for only $8 (normally probably a $40-$50 hat!!) on a clearance rack. *Not really a frugal accomplishment per se, but a testimony to how awesome God works–this is what happened just yesterday. We had had another bill roll in from the dentist for two root canals Jeff had to have like two weeks before his incident. (As if the poor guy has not been tortured enough lately, yowza!) Within a couple of days, we had 3 different reimbursement checks show up for things him or I had paid for at work or church lately. Y’all, this is SO cool–without thinking, I added up the amount from the reimbursement checks and it was literally the SAME amount as the bill from the dentist, plus 9 cents to spare. I could have cried. God is good. They were cashed and taken directly to the dentist. Thanks for stopping in! Hope your summer is going well.